What resonated most, officers of the Secret Intelligence Service – more commonly known as MI6 – have suggested, were the paintings of hotel rooms. In shades of grey and blue, with a hint of claustrophobia, they captured scenes that were only too familiar, observed Her Majesty's professional spies, commenting on the work of the service's resident artist. Their job may appear exotic, but as the artist, James Hart Dyke, noted, spies spend long hours hanging around. "You're in a completely ordinary place, waiting for something to happen ... and often waiting for it for a long time." And spying, say its practitioners, may have its exotic moments in exotic places, but it is always potentially dangerous and anxious-making. All may not be what it seems, as many of Hart Dyke's pictures on show at London's Mount Street Galleries imply. Sir John Scarlett, former head of MI6, who commissioned the works of art to mark the agency's centenary, described the exhibition as "quite a subtle form of openness". He added: "There is a sense of mystery, the secrecy, the subtlety, that sense that you look at a scene and it actually isn't quite what you think it is or has an aspect that you're not aware of, which comes through rather strongly. "It also makes clear that this isn't James Bond racing around conducting his own operations as he sees fit. There is a strong aspect of the everyday about it." So what did the rubber duck with three circles – two white and one green – signify? The circles, it was suggested, were echoes of the bullet holes that form a background to the opening credits of Bond films. The green one could be a reference to the green ink in which C, the head of MI6, always signs his secret missives. However, neither Scarlett nor a group of his former employees explained the duck. They implied it might have a hidden meaning, a reference to a particular operation, perhaps. It was only after I had parted their company that I recalled that in Goldfinger, James Bond wears a wetsuit with a rubber duck on his head to infiltrate a drugs factory. It wasn't so long ago that MI6 noted on its official website: "James Bond, as Ian Fleming originally conceived him, was based on reality. But any author needs to inject a level of glamour and excitement beyond reality in order to sell." This article was published on the Guardian website at 14.49 EST on Monday 14 February 2011 . A version appeared in the Guardian on Monday 14 February 2011 . It was last modified at 02.51 EDT on Tuesday 20 May 2014 . It was a top-secret mission he couldn't refuse. 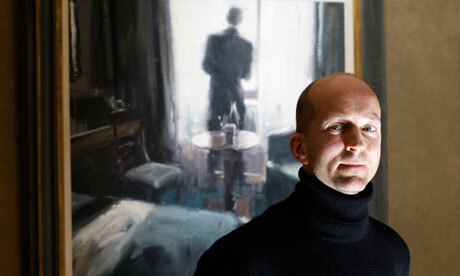 Painter James Hart Dyke was assigned to shadow spooks for a year, sketchbook in hand. What did he learn about their mysterious world?